Their origins and previous gigs before they were to become one of the biggest bands of the 1980s. Before The Police became one of the top pop-rock acts of the early 1980s, each member of the band had already been involved in the music industry for a considerable amount of time. 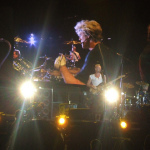 Bassist/singer Sting, drummer Stewart Copeland and guitarist Andy Summers were all talented musicians, yet their advanced musical pedigrees were largely what made it difficult for them to establish any credibility on the British punk scene in the late 1970s that valued raw energy and attitude over actual musical abilities. The unique life experiences of each member of The Police also contributed greatly to what would eventually make their combined sound so special on such songs as “Roxanne,” “Message in a Bottle,” and “Every Breath You Take” To fully appreciate the music of The Police, one should understand their individual origins and backgrounds, as well as learn more about the artists and groups with which they had previously worked. 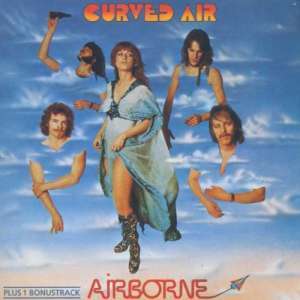 Airborne, one of two studio albums by Curved Air featuring Stewart Copeland on the drums. Available at Amazon. Stewart Armstrong Copeland was born July 16, 1952 in Alexandria, Virginia. He is the youngest of four siblings, Lorraine being the oldest, followed by Miles III and Ian. The Copeland brothers would become perhaps the most influential musical family dynasty of the late 70s/early 80s, as Stewart would form The Police, Miles would head up IRS records, and Ian created the FBI booking agency. The siblings spent the bulk of their childhood years growing up in Beirut and Egypt, where their father, Miles Jr., worked as one of the founders of the Central Intelligence Agency and had major influence over the development (and disarray) of many Middle Eastern nations. Stewart scored his first gig playing drums at the age of 12, thanks to fledgling booking agent Ian, who got him a gig with a local beach band in Beirut. By oft-repeated legend, Stewart also lost his virginity that very same night to an older and very appreciative groupie, setting the stage for a long and exciting career in the rock music industry. Stewart frequently attributes the unique style and polyrhythms of his drumming to his childhood in the Middle East and the music native to the region. The Copeland family moved to England when Stewart was in his later teens, after things became too dangerous for them in the Middle East. It was at this time Stewart realized he didn’t actually speak proper English, only the odd English/Arabic mixture that was the norm in the Copeland household growing up. Schooling at an exclusive academy corrected this shortcoming, however, and drumming would remain a solitary activity for Stewart for many of the years to follow. After attending college in California, and working as a tour manager for some of brother Miles’ acts in the early ’70s such as Joan Armatrading, Stewart would finally get a job playing drums with the progressive rock band Curved Air in 1975. 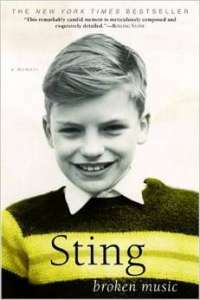 “Broken Music”, Sting’s 2005 autobiography which focuses on his early life. Available at Amazon. Sting was born Gordon Sumner on October 2, 1951 in Newcastle, England. His family background was strictly working-class, Catholic, and by his own accounts rather desperate and dreary. 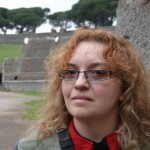 The eldest of four children, his younger siblings were Philip, Angela, and Anita. His mother was a hairdresser and his father worked hard to keep a dairy afloat – even after his wife began a continuing affair with one of his employed helpers. 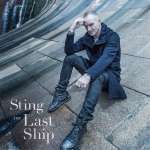 Music would become Sting’s “escape” from his surroundings from an early age, as he would teach himself to play guitar to Beatles and Rolling Stones records before discovering jazz, and later, the bass guitar. He squeaked through school and worked on building sites and in Civil Service before completing a teachers’ course so he could pay the bills, all the while looking for any good opportunity to work as a musician instead. He scored gigs with bands including the Phoenix Jazzmen and the Newcastle Big Band. It was during his time with the Phoenix Jazzmen that he earned the nickname “Sting” because of a yellow-and-black striped sweater he wore for a performance. In the early 1970s he formed the jazz/fusion group Last Exit, and spent the next few years trying to build up their reputation and then convince them to move to London, where he felt their only chance for long term success would lie. In 1976 he married actress Frances Tomelty, had his first child Joe, and the time was critical to make that break for success, with or without his band mates in Last Exit. He was approached by Stewart Copeland after that fateful gig in Newcastle and given a number to call should he ever find himself in London and want to join a new band. Sting, always the opportunist, knew he was headed that way no matter what, so why not follow Copeland’s lead even if punk rock had never been his calling or interest. He did not hang all of his hopes on the band, however, as punk was not to his tastes and he was still trying to make something of Last Exit. At one point he even nearly left the band when an opportunity to tour with Billy Ocean presented itself. 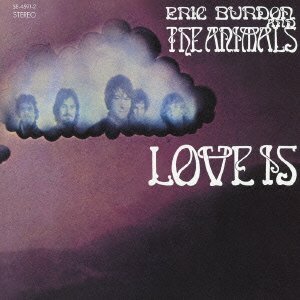 “Love Is” by Eric Burdon and The Animals. Available at Amazon. Andrew James Somers was born December 31, 1942 in Blackpool, where his father owned a restaurant. The family, which was fairly well-off and upper middle-class, would later move to Bournemouth on the south coast. Like Stewart he had one sister, Monica, and two brothers, Tony and Richard. Andy specialized in music in school and by 17 was playing with Zoot Money’s Big Roll Band, a favorite with the mid 60’s mods. He played with them through 1967, around which time he would be “memorialized” in Jenny Fabian’s book “Groupie” as the character “Davey.” As psychedelia became all the rage, the band changed its name and style and became Dantalion’s Chariot, but neither version of the act made it big beyond the London club scene. Summers then toured with Soft Machine in 1968. Summers would then travel to America to tour with Eric Burdon’s New Animals and record the album “Love Is” with the band. Afterwards, for a time he would study classical guitar, attempt a career as an actor, marry and divorce singer Robin Lane, meet future wife Kate and then move back to England by 1975. He was always busy, finding work as a session and touring guitarist with acts such as Kevin Ayers, Kevin Coyne, David Essex and Neil Sadaka, but always with that super-stardom success he truly craved just out of his reach. Summers would continue to gig around England as a sought-after session musician until a gig with Mike Howlett would lead to crossed paths with two other talented musicians, who just happened to have a fledgling punk band suffering from a lousy guitarist. That band called themselves The Police. Andy was sure he was just what they needed, even if it would take a little convincing to get his foot in the door. 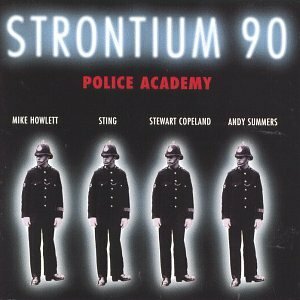 “Strontium 90”, featuring some of the recordings and live performances of Mike Howlett, Sting, Stewart Copeland and Andy Summers. Available at Amazon. They were The Police right from the start, even before they were the lineup we’re familiar with today. When drummer Stewart Copeland heard Sting playing that night in Newcastle with Last Exit, he knew he’d found himself a star waiting to happen. Inviting the singer/bassist to join him in London to be part of his new “punk band”, Stewart didn’t have much more in mind beyond a concept: a three-piece group (three because then you could all fit in one touring band), stripped of all the pomp and pretension of prog rock. He also recruited Henry Padovani, a Corsican guitarist who at the time didn’t speak much English – nor did he know how to play the guitar but he looked great in leather pants. As such he was really the only true punk among them. In 1977, they released their first single, “Fall Out/Nothing Achieving”, which made little impression upon the charts, nor with the true punks who knew a bunch of posers when they heard them. It was a lean period during which Sting debated his options carefully, for he still had not given up hope of Last Exit moving to London and was highly uncomfortable trying to fit into the punk scene, playing music he didn’t like to crowds he absolutely hated. Not adverse to taking any odd gig to help pay the bills during these scrappy early days, in 1977 Sting and Stewart agreed to play on some demos with Mike Howlett, former bass player with Gong. Also recruited for these demos, and a festival concert to follow, was accomplished session guitarist Andy Summers. Ten years older and more experienced in the world of rock than the others, in Sting and Stewart he saw his ticket to finally make a real name for himself – and he wasn’t about to take no for an answer. Although Stewart was leery to bring in a former hippie/long hair, further destroying any illusion of punk credibility, Sting was overjoyed at the prospect of being able to write songs for a guitarist who actually could play his instrument. After the festival, Henry was soon out, and Andy was in. The Police as we know them today were born. 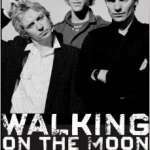 Widespread success would still take some time to come to the band, but eventually The Police would be topping the pop charts and creating music known and loved by many still today. * Summers, Andy. One Train Later: a Memoir. New York: Thomas Dunne, 2006. Print. * Sting. Broken Music: a Memoir. New York: Dial, 2003. Print. * Sutcliffe, Phil, and Hugh Fielder. The Police: L’historia Bandido. London: Proteus, 1981. Print. * Copeland, Stewart. 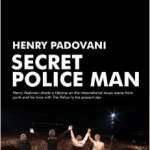 Strange Things Happen: a Life with the Police, Polo, and Pygmies. New York: HarperStudio, 2009. Print.